Mandibular canine is generally considered to have one root and one canal, but it may possess two canals and even less frequently two roots and two or three canals. This article highlights the identification and endodontic management of two cases of a rare anatomical variation in mandibular canine with two roots and two canals. Missed canal/root is one of the main reasons for the failure of the root canal treatment. Variation in root and root canal morphology can be found in any tooth in the dental arch with varying degree of incidence. A thorough knowledge of the external and internal anatomy of teeth with its possible aberration is essential to ensure the success of endodontic treatment. Morphologically, mandibular canine is usually considered a monoradicular tooth with single root canal. Like other teeth in the dental arch, mandibular canine also does not always display the basic anatomy with one root and one canal. 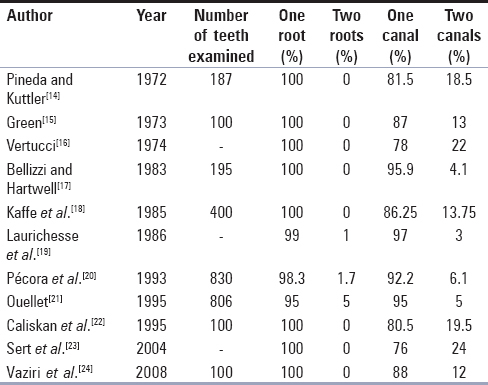 Several researchers have reported anatomical variations with varying degrees associated with mandibular canines [Table 1].,,,,,,,,,,, Occurrence of mandibular canines with one root and two root canals has been reported to be about 0%–24% in various ethnic groups [Table 2].,,,,,,,,,, However, the occurrence of two roots with two or more canals is rare ranging from 0% to 5% [Table 2]. 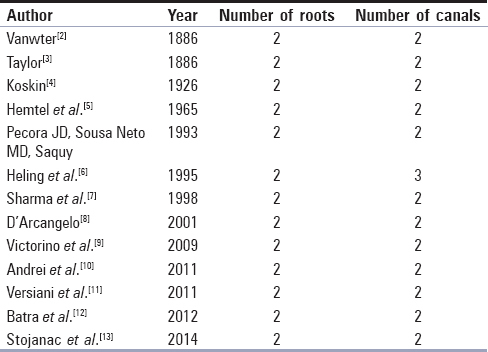 Despite the low occurrence of anatomical variations in mandibular canine, endodontists should be aware of possible variations with respect to the number of roots and root canals. Conventional radiographs may not be able to give details about the root canal configuration in teeth with complex root canal morphology such as multiple root canals and extra roots, especially when present in buccolingual direction. Inadequate details may lead to poor prognosis. Advanced radiographic techniques such as the cone-beam computed tomography (CBCT) may result in three-dimensional evaluation of root canal configuration, thus predicting success. This article reports endodontic management of mandibular canines with two roots and two canals. CBCT was done to confirm the internal anatomy of the tooth. A 28-year-old female patient was referred to the Department of Conservative Dentistry and Endodontics with a complaint of pain in her lower right front tooth. The patient gave a history of root canal treatment done in relation to 43 by some general dentist, but as symptoms were not relieved, retreatment was attempted and gutta-percha was removed by the same dentist. On clinical examination, the tooth was tender on percussion. 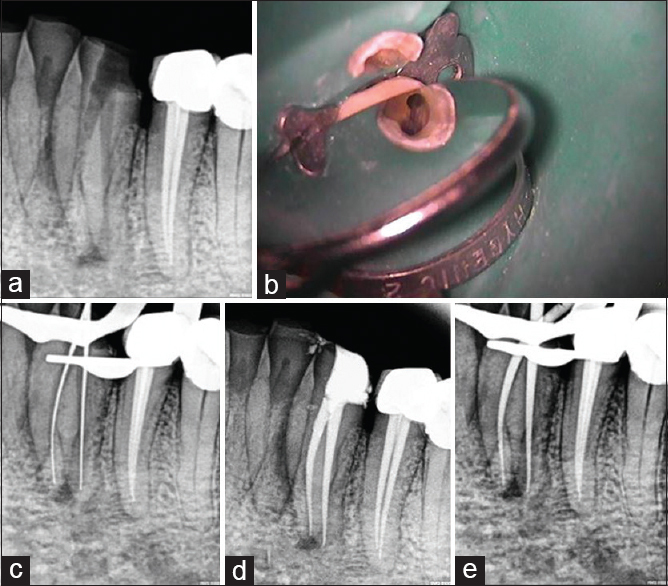 Radiographic examination created a suspicion of the presence of two roots with respect to 43 [Figure 1]a. CBCT examination confirmed the presence of two roots (one buccal and one lingual) and root bifurcation was present at the cervical-third of the roots [Figure 1]c and [Figure 1]d. Under rubber dam isolation, access cavity was modified to access both the canal orifices (buccal and lingual) [Figure 1]b. Working length was measured with Canal Pro Apex Locator (Coltene, Whaledent GmbH, Germany) and confirmed radiographically [Figure 1]e. Canal preparation was done with ProTaper rotary system (Dentsply-Maillefer, Ballaigues, Switzerland) till size F3 for each canal. Irrigation with 3% NaOCl was done in between change of instruments. Calcium hydroxide (Prime dental PVT, India) was placed as an intracanal medicament for 1 week. Obturation was done with the corresponding ProTaper gutta-percha (Dentsply-Maillefer, Ballaigues, Switzerland) using AH Plus sealer (Dentsply) [Figure 1]f and [Figure 1]g. Later on, postendodontic restoration was done with composite resin. The patient was asymptomatic during follow-up period. A 50-year-old male patient presented with the history of severe pain in the lower left front tooth region for the past 2–3 days. On clinical examination, there was generalized attrition in the anterior teeth. The first premolar was endodontically treated and both the premolars were restored with crowns. The left lower canine (33) was tender on percussion. The tooth showed delayed response to pulp vitality tests as compared to healthy contralateral tooth. The diagnostic radiograph revealed widening of the periodontal ligament space in relation to 33 [Figure 2]a. Based on the clinical and radiographic examination, a diagnosis of irreversible pulpitis with acute apical periodontitis was established and root canal treatment was planned. The treatment was explained to the patient and consent was obtained. Preoperative radiograph gave the suspicion of two roots in relation to left mandibular canine which was confirmed with multiple angled radiographs. Under local anesthesia, after rubber dam placement, access was made. Access was modified to expose two orifices, one buccal and one lingual [Figure 2]b. Working length was established using Canal Pro Apex Locator (Coltene, Whaledent GmbH, Germany) and confirmed radiographically for both the canals [Figure 2]c. Chemomechanical preparation was performed using ProTaper file system (Dentsply-Maillefer, Ballaigues, Switzerland) in a crown-down manner. About 3% solution of sodium hypochlorite and 17% ethylenediaminetetraacetic acid were used alternatively as irrigants at every change of instrument. 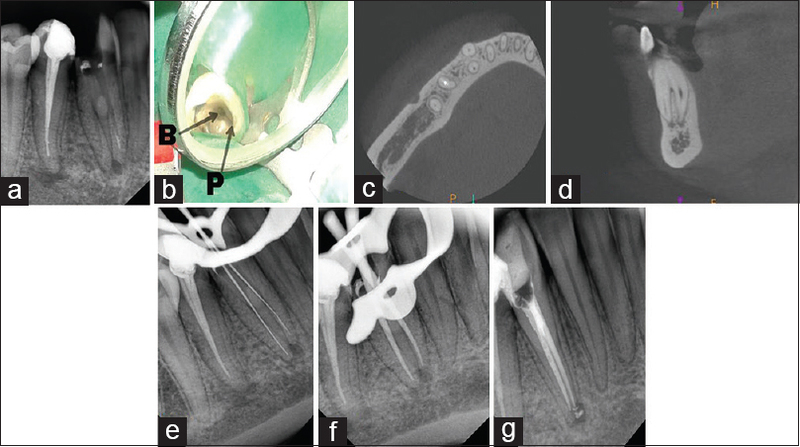 The apical preparation was done to F2 file size in both the canals, and the canals were obturated with corresponding ProTaper gutta-percha cones (Dentsply-Maillefer, Ballaigues, Switzerland) [Figure 2]d and [Figure 2]e. The patient was asymptomatic during the follow-up period of 10 months. Proper diagnosis and identification of the possible permutations of the canal morphology are essential for the success of endodontic treatment. Failure to locate and treat an extra root/canal is one of the most common causes of root canal treatment failure. Detailed clinical and radiographic examinations are critical factor in detecting morphological variations. In mandibular canine with two roots, roots are generally positioned buccally and lingually which can be easily overlooked on preoperative radiograph due to superimposition of roots and canals. Radiographs taken with different horizontal angulations may help in identification or at least suspicion of root and root canal variations, but sometimes establishment of definite diagnosis may require CBCT. Second root/canal in the mandibular canine can branch from the apical-, middle-, or coronal-thirds.,, Two roots may be observed separately radiographically when bifurcation is present either in the cervical or in middle thirds and in not in the line of the X-ray beam, whereas bifurcation which is present more apically is difficult to diagnose and treat. In the present case, the presence of the two roots was suspected on intraoral periapical as buccal root was present slightly mesially as compared to the lingual root and there was no exact superimposition of both the roots in angled radiograph. In mandibular canine, usually one canal is present which exits as a single foramen at the apex. At times, two root canals or rarely three root canals with two roots, can be present. In the present case, we found two root canals, one buccal and one lingual in each buccal and lingual root. Various researchers have carried out studies to demonstrate variation in the root/canal anatomy in different races using different methods.,,,,,,,,,, Variations in the internal anatomy among populations could be due to the differences in genetics and racial variations in the population, sample size, techniques, classification systems, and the researchers' judgment and diagnosis. It is important to detect such anatomical variations before the initiation of endodontic treatment to prevent iatrogenic mishaps and to gain high success. The dental anatomical knowledge is an essential condition in the practice of endodontics. Hence, before the beginning of the treatment, a thorough knowledge of the root canal anatomy is important to achieve good results. Although the incidence of mandibular canine with two roots and two or three canals is low, it can exist. A thorough knowledge of the tooth and root canal morphology, clinical exploration, and detailed radiographic interpretation as well as use of advanced radiographic technique may be helpful in detecting root canal aberrations and to achieve success. Bergenholtz G, Horsted-Bindslev P, Reit C. Textbook of Endodontology. 2nd ed. Oxford: Wiley-Blackwell Publishing Ltd.; 2010. Vanwter GA. Dental anomalies. D Cosmos 1886;28:64. Taylor D. Two distinct roots in inferior cuspid. D Cosmos 1886;28:128. Koskin GA. Cuspids with two roots. D Cosmos 1926;68:403. Hemtel C, Madeira MC, Bemabe JM. Contribuicoaobestudo dos caninos inferiors birradiculados. Rev Fac Odontol Arecatuba 1965;1:83-92. Heling I, Gottlieb Dadon I, Chandler N. Mandibular canine with two roots and three root canals. Dent Traumatol 1995;11:301-2. Sharma R, Pécora JD, Lumley PJ, Walmsley AD. The external and internal anat-omy of human mandibular canine teeth with two roots. Endod Dent Traumatol 1998;14:88-92. D'Arcangelo C, Varvara G, De Fazio P. Root canal treatment in mandibular canines with two roots: A report of two cases. Int Endod J 2001;34:331-4. Victorino FR, Bernardes RA, Baldi JV, Moraes IG, Bernardinelli N, Garcia RB, et al. Bilateral mandibular canines with two roots and two separate canals: Case report. Braz Dent J 2009;20:84-6. Andrei OC, Mărgărit R, Gheorghiu IM. Endodontic treatment of a mandibular canine with two roots. Rom J Morphol Embryol 2011;52:923-6. Versiani MA, Pécora JD, Sousa-Neto MD. The anatomy of two-rooted mandibular canines determined using micro-computed tomography. Int Endod J 2011;44:682-7. Batra R, Kumar A, Bhardwaj K. Root canal treatment in mandibular canine with two roots: A case report. Int J Contemp Dent 2012;3:54-6. Stojanac I, Premović M, Drobac M, Ramić B, Petrović L. Clinical features and endodontic treatment of two-rooted mandibular canines: Report of four cases. Srp Arh Celok Lek 2014;142:592-6. Pineda F, Kuttler Y. Mesiodistal and buccolingual roentgenographic investigation of 7,275 root canals. Oral Surg Oral Med Oral Pathol 1972;33:101-10. Green D. Double canals in single roots. Oral Surg Oral Med Oral Pathol 1973;35:689-96. Vertucci FJ. Root canal anatomy of the mandibular anterior teeth. J Am Dent Assoc 1974;89:369-71. Bellizzi R, Hartwell G. Clinical investigation of in vivo endodontically treated mandibular anterior teeth. J Endod 1983;9:246-8. Kaffe I, Kaufman A, Littner MM, Lazarson A. Radiographic study of the root canal system of mandibular anterior teeth. Int Endod J 1985;18:253-9. Laurichesse JM, Maestroni J, Breillat J. Endodontie Clinique. 1st ed. Paris, France: CdP; 1986. p. 64-6. Pécora JD, Sousa Neto MD, Saquy PC. Internal anatomy, direction and number of roots and size of human mandibular canines. Braz Dent J 1993;4:53-7. Ouellet R. Mandibular permanent cuspids with two roots. J Can Dent Assoc 1995;61:159-61. Calişkan MK, Pehlivan Y, Sepetçioğlu F, Türkün M, Tuncer SS. Root canal morphology of human permanent teeth in a Turkish population. J Endod 1995;21:200-4. Sert S, Aslanalp V, Tanalp J. Investigation of the root canal configurations of mandibular permanent teeth in the Turkish population. Int Endod J 2004;37:494-9. Vaziri PB, Kasraee S, Abdolsamadi HR, Abdollahzadeh S, Esmaeli F, Nazari S, et al. Root canal configuration of one rooted mandibular canine in an Iranian population: An in vitro study. J Dent Res Dent Clin Dent Prospects 2008;2:28-32.